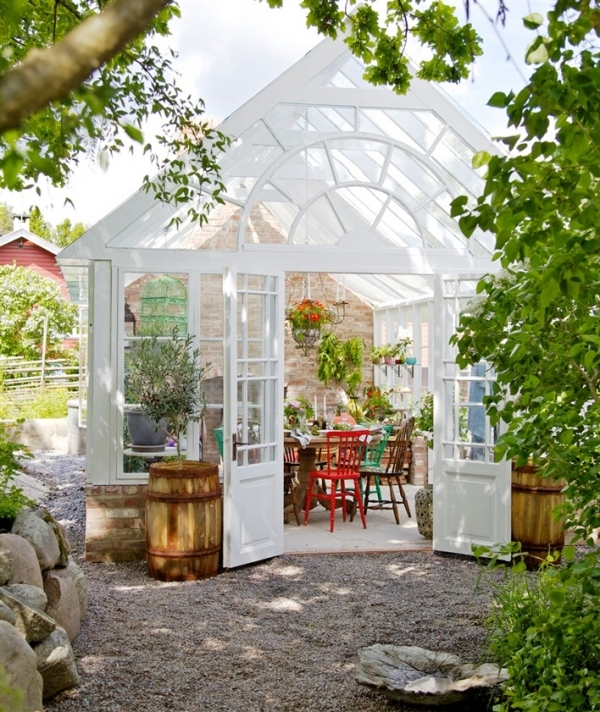 This Swedish greenhouse design is a little bit of Heaven on Earth….. The exterior of the greenhouse is white, and it is surrounded by gravel, gorgeous rocks, and lush greenery. The beautiful design screams elegance, announcing its uniqueness and originality. The designers of this wonderful space created a dreamy living area, fashioning a place to entertain and a place to relax. 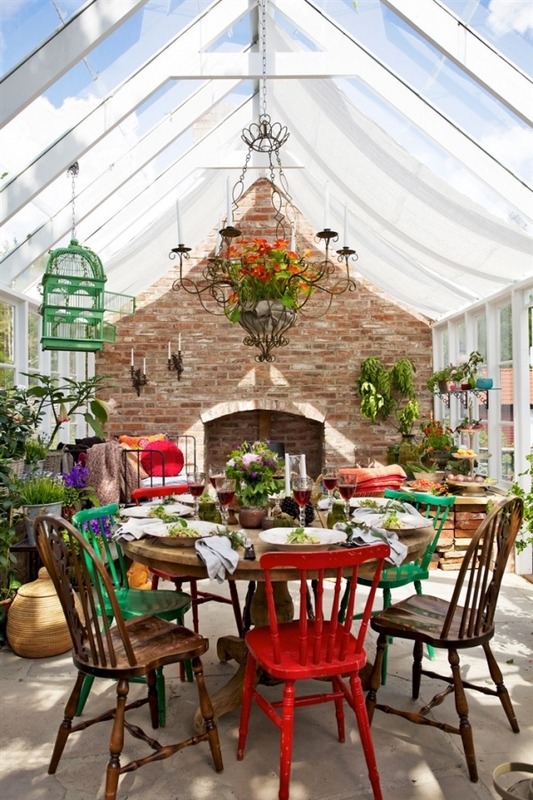 The inside of the greenhouse has a lovely stone floor and a fantastic wooden dining table. The red and green chairs, complement each other, adding bursts of color to the space. The brown chairs, keep the decor grounded in nature, gorgeously opposing the bright colors. 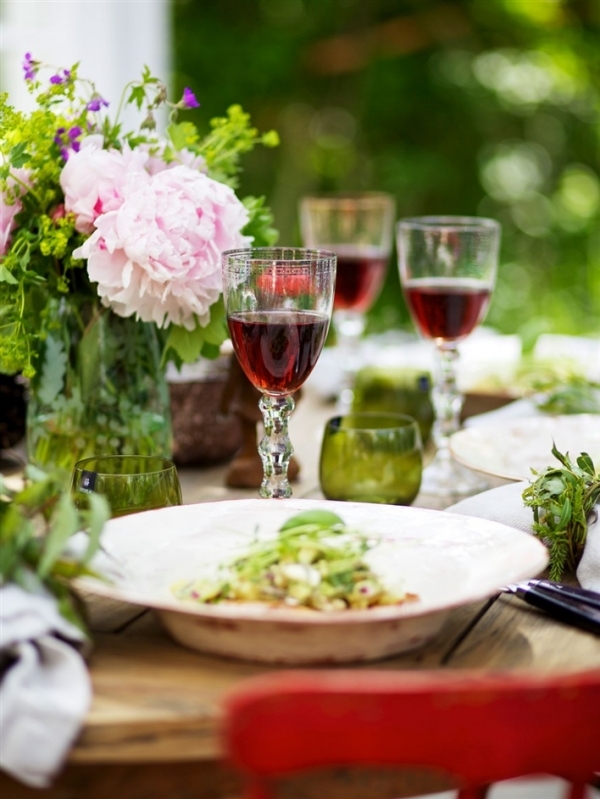 A detailed chandelier, with red flowers on the inside of it, hangs over the dining table, providing fantastic lighting for greenhouse dinners. As we travel towards the back of this luxurious greenhouse design, we pass a bright green birdcage: a whimsical and fitting design touch. 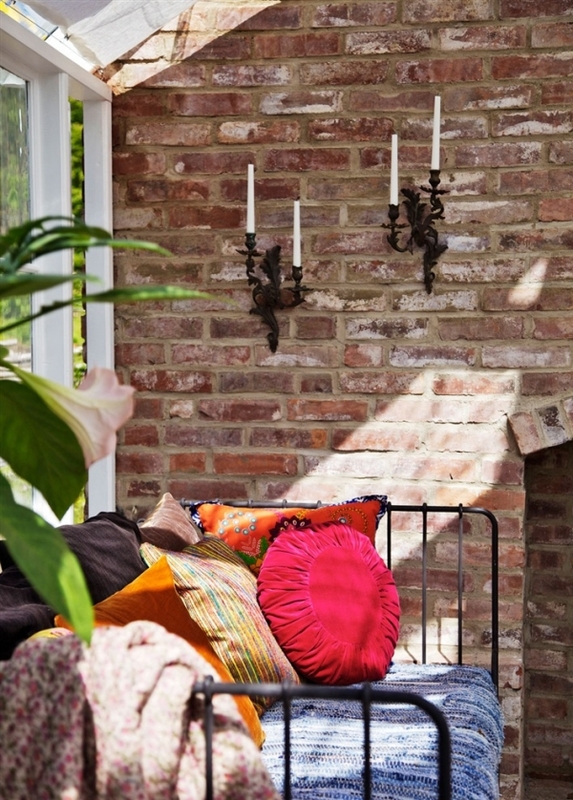 Fantastic brick and a fireplace frame the back wall of this gorgeous wonderland. A black iron sofa, with multi-colored pillows and blankets, sits on one side of the fireplace, adding bold color to the space. Candelabras with white candles line the brick wall, adding an enchanting romanticism. It would be amazing to relax on this sofa with the fire going and the candles lit, on a clear and cool night. On the other side, the handsome workbench, is created with wood and bricks. 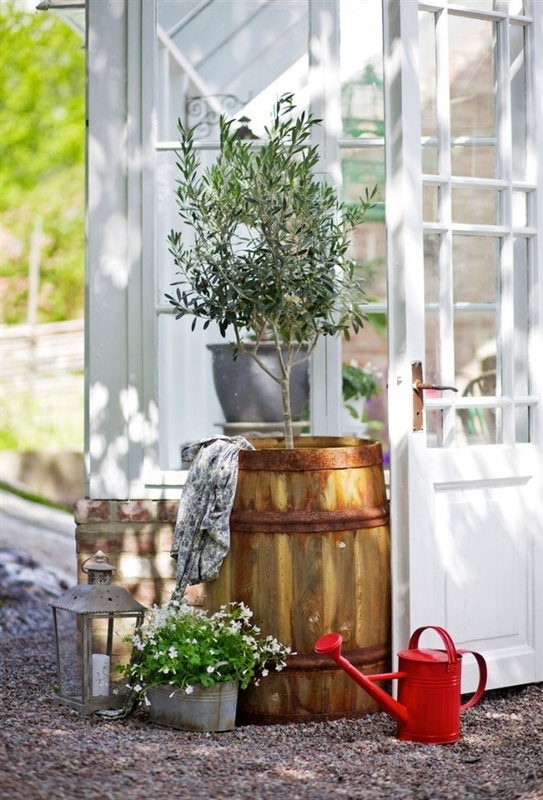 Garden tools, fruits and vegetables, and ravishing plants fill this space. 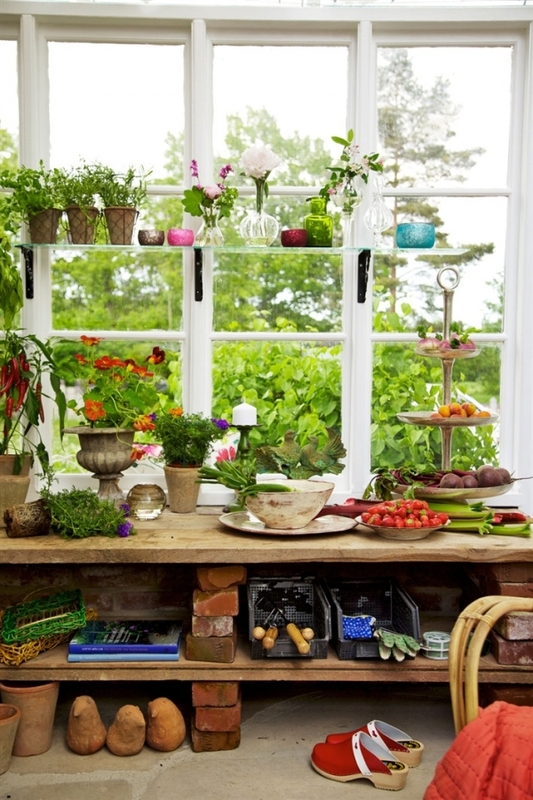 Glass shelving, above the workbench, provides additional storage. 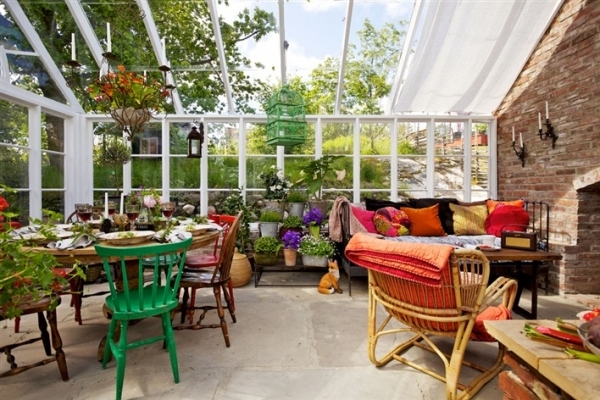 This space is absolutely gorgeous and unique, its design multiplies the usefulness of a greenhouse. 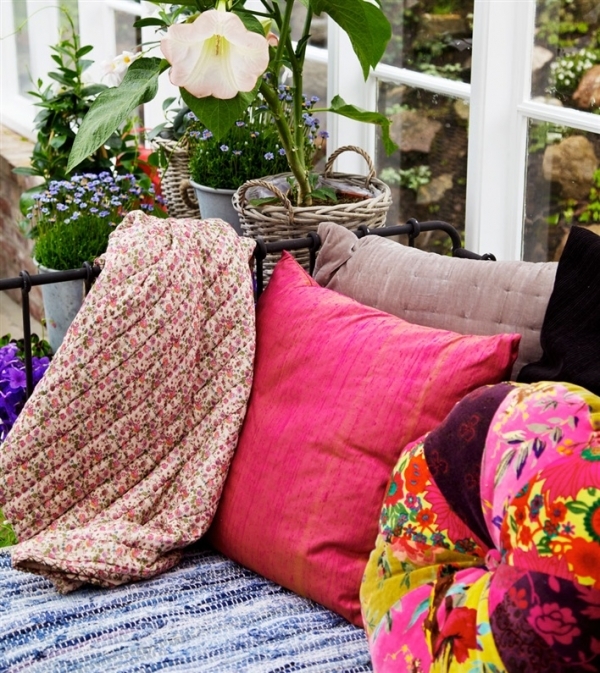 It creates a gorgeous wonderland that isn’t just for plants, it is also a place to relax, nurturing you and your greenery.